While we also offer our customers stock boxes, our primary business is the production of custom sized boxes, unique to a given customer and product requirement. Custom boxes account for over 95% or our corrugated production. Our rotary and flat bed die cutting machines, in combination with our Bobst specialty folder gluer, can produce an unlimited number of box designs and styles. A rule of thumb we often use is that if it is made out of corrugated, we can make it for you. Take a tour of our Westwood corrugated sheet plant. We run the full spectrum of single wall and double wall corrugated board in both our Westwood and our Littleton facilities. 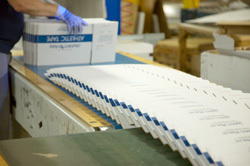 Our LIttleton facility also specializes in small runs, physically large boxes, and triple wall boxes.